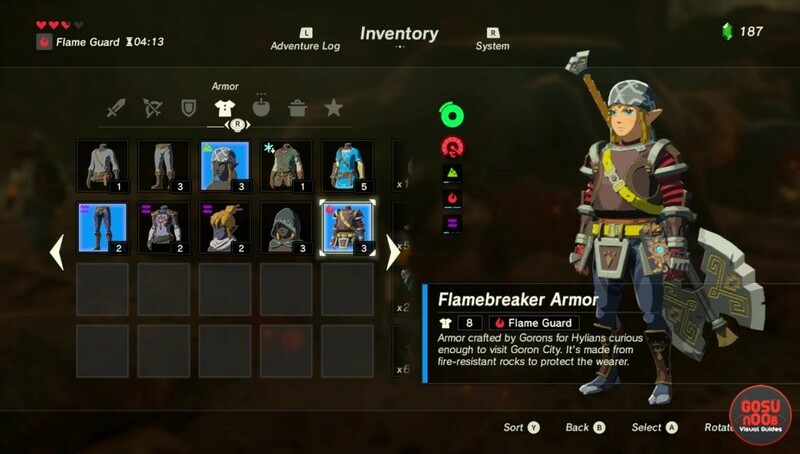 Flamebreaker Armor is an outfit in Zelda Breath of The Wild. It provides heat and lava resistance to Link, making it possible to enter volcanic areas and not worry about combusting. It can be bought from stores, but it’s pretty expensive. Luckily, there’s an easy way to get a piece, which will be enough for starters. In this guide, we’re going to show you how to get heat & lava resistance armor in Zelda Breath of The Wild, how to survive heat before you get it. The first thing you need to do is head to Foothill Stable, south of the giant volcano in the north-east. You’ll see a girl with a broom in front of the stable. Her name is Gaile. Talk to her, and buy 3 Fireproof Elixirs. You’ll need 150 rupees, which you can get using our money making guide. Take the road north, into the Eldin region. Follow it until you pass a wooden bridge across a lava stream. This part is called Southern Goron Mine. As soon as you’re off the bridge, look to your left. You should see a weary traveler called Kima. She’ll offer you the Flamebreaker armor in exchange for 10 Fireproof Lizards. They’re not hard to find, but they spook easily, so you’ll have to sneak up on them. Look around the area between the two bridges. If you catch all the ones that roam freely and still don’t have enough, you can lift rocks and find them under. Just keep in mind you need to press the grab button as soon as you start lifting the rock, or else the lizard will escape. Once you’ve got 10, talk to Kima again, and she’ll give you the suit. If you want the helmet and trousers, you’ll have to visit Goron City farther up the road. Go to the armor store there and you’ll see them on display. The Flamebreaker Boots cost 700 rupees, while the Flamebreaker Helmet is a whooping 2000. The Gerudo set is another outfit that offers protection from heat. You can get the whole set for free in Kara Kara Bazaar, in the southweastern part of the map. It’s a woman’s outfit, and Link doesn’t seem to comfortable wearing it at first, but if you want to grab it, you should just follow our guide on how to get into Gerudo Town. Gerudo outfit does not protect against the heat. The Gerudo clothes cost 600 for the full outfit. Actually you can just plain buy it in Gerudo town with out doing the Tarry Town quest. Actually the only outfit I have found in gerudo town is the exact outfit you get from the dude at that outpost when you are trying to get in and the women selling just says when you have multiple of the same clothes it’s time to start turning them different colors. There is no male version for sale. You have to find and get into the Gerudo Secret Club to buy the male version. Heat resistance does not protect against the heat in the death mountain area. It has to be the flameproof effect. Flamebreaker armor doesn’t protect against heat either, only flame resistant. This game is total baloney! The fact I have to research answers, because they’re not self evident from the quest list is just proof of that. I’m boiling inside just thinking about it! I want my $60 back! SERIOUSLY!